I would thoroughly recommend this book to all who have the slightest interest in South West France, because once you start reading the book, you will not be able to put it down. This book tells the story of a region of France whose history is really the history of Europe. The author, whose work was new to me, writes in an extremely engaging way. I really enjoyed this and was very glad I took a chance on it. Highly recommend to history readers or anyone interested in Europe. 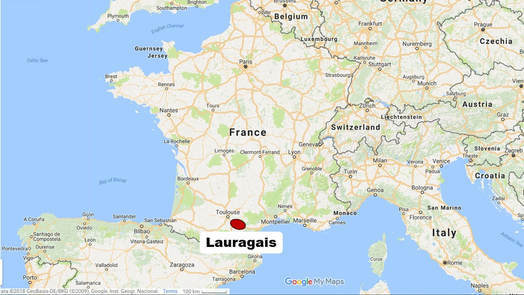 The Lauragais lies in south-west France at the heart of Occitania. Today it is largely ignored by the millions who visit its neighbours each year – Toulouse and Carcassonne – but in times gone by it rarely escaped the attentions of the great and the good, or the ambitious and the avaricious. This is a book with big characters – Simon de Montfort, the Black Prince, Thomas Jefferson and the Duke of Wellington among others – but most of all it tells the story of the people who have shaped this land, the living and the dead, families that have lived in the same house or village for hundreds of years. This is the story of their lives, their religion, their forgotten language and their environment. The only time the Cathars crushed Simon de Montfort’s crusaders during the Albigensian Crusade was at Château de Montgey in 1211. With the help of the current owner, the author investigates the massacre of 6,000 pilgrim-soldiers perpetrated by the lord of Montgey. A couple of generations ago, most people in the Lauragais still spoke Occitan, the language of the troubadours. The author sets out on the trail of a wandering minstrel who lived the life of a modern celebrity, and explores the history and future prospects of the language with the help of an expert from the University of Montpellier. 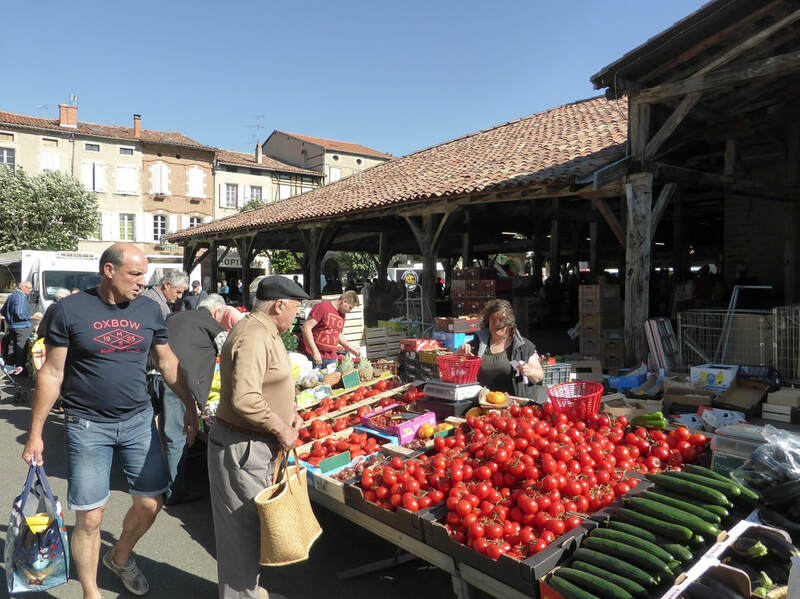 A visit to one of the most beautiful markets in France reveals what it was like to live in a new town in the 1340s when war, famine, pestilence and death stalked the land. We also meet the man who rediscovered the last remaining section of the town walls hidden inside an abandoned garage. The author retraces the Black Prince’s devastating campaign through the Lauragais in 1355, and discovers the ruined hideout of the fearsome brigands who terrorised the countryside for forty years. 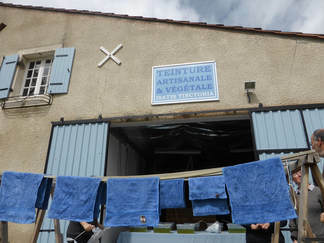 Starting in 1460, Toulouse and the Lauragais enjoyed an extraordinary century of prosperity built on pastel, or woad. The author retraces its meteoric rise and spectacular fall, and learns about the industry’s rebirth in the 1990s from those who work with woad today. Today, Puylaurens is a sleepy town, but its turbulent history encapsulates the story of French Protestantism, from Jean Calvin to the flight of the Huguenots, interspersed with four decades of relentless civil wars and a quarter-of-a-century of academic achievement. The author profits from a rare chance to get to the bottom of what keeps the Canal du Midi full of water. The key is the dam of Saint-Ferréol, started in 1667, hailed in its day as the eighth wonder of the world. Thomas Jefferson provides social commentary on life on the canal. The mystery of who is really buried in a forgotten English cemetery takes the author back to the Battle of Toulouse in 1814, a pointless battle fought by the Duke of Wellington and 100,000 other men after the war was over. The author retraces the footsteps of the Resistance: where they hid, how they operated and the battles they fought against the Germans in 1944. The owners of the Château de Garrevaques recount their wartime experiences and how the Germans tried to blow up their home. This ten-minute video was made so that readers of 'Lauragais' can see the places described in the book. To understand all the references, you need to read the book, but meanwhile, feel free to enjoy these glorious images of the Lauragais! Where can I buy my copy of 'Lauragais'? ​If you live in or around the Lauragais, you can buy the book in tourist offices including Castelnaudary, Puylaurens, Revel and Port-Lauragais (Maison de la Haute-Garonne), and in the bookshop Ombres Blanches in Toulouse. or if you would like a signed copy, ​please contact the author. ​It is also available as an eBook on all the major platforms.